The main purchase here is once again not gaming related but the reason I got it is, sort of. For the good of the land I mean stream! If you've been following us, you'd probably know that I've been having a lot of microphone issues when I stream. I could do the simple thing and just stream the game and the game audio but I want both game audio and microphone audio at the same time. My laptop's microphone may be the best mic I have right now but since it is considered a USB device, I can only choose either game audio or mic audio as the audio source in FME (Flash Media Live Encoder). I've tried every workaround I could think off. None of which have worked in my favor. In most cases the microphone would be clear but too weak and the game audio would always be too loud. Boosting the mic would ruin the audio quality and bring forth a lot of noise. I got a USB audio box so that I could have a line-in jack and just stick the red and white audio RCA cables in but that made the game audio waaay too loud. The only real solution would be just to man-up and get myself a real audio mixer. Audio mixers aren't exactly cheap so I was scared as to how much I might have to spend to get one or if I could even find one small enough for what I had in mind. Luckily I found one that went for only 3500php and was USB powered which was exactly what I needed. It was the Behringer Xenyx 302USB Audio Interface. It's USB powered with a plug-and-play audio driver which makes things even simpler. It features a 6.5mm microphone / instrument jack, 2 sets of stereo RCA input jacks, 1 set of stereo output jacks, 1 3.5mm headphone jack, and 1 3.5mm microphone jack. I only really needed 1 mic in and 1 set of RCA stereo ins but the extra stuff may prove usefull for something else later on. I freaking love this audio mixer. Easy to use, easy to operate and does what I want it to do just right. I wish I had gotten it sooner. Alright, enough about the mixer. Time for the actual videogame purchases. 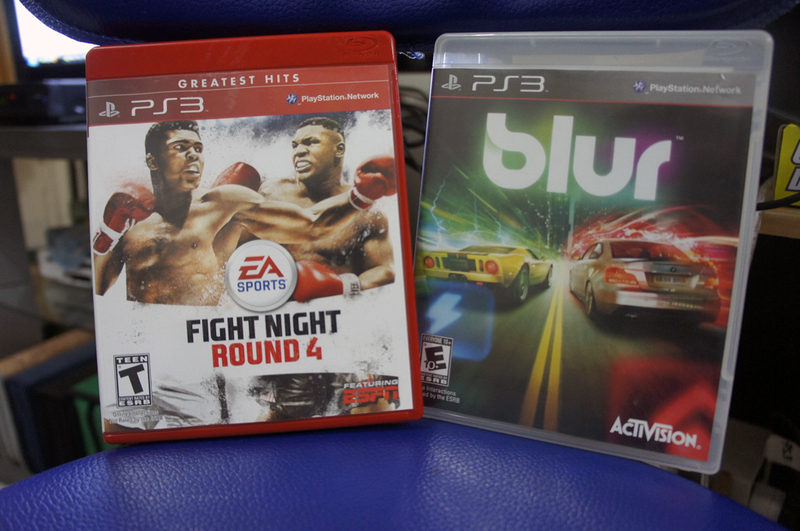 I got a brand new "Greatest Hits" copy of Fight Night: Round 4. I heard Fight Night: Champion wasn't so hot so I decided to go for the previous iteration. This game isn't meant for me but of course I had to "test it out" (evil smirk). Next up was for me and that is Blur, the racing game with "kart racing" style weaponry. This racing game feature licenced cars and weapon based action. But instead of bullets and missiles like in Death Race, the weapons are more neon and energy based which gives off the NFS-style street racing vibe. That's all for this episode of Recent Buys. Was planning to get a PSN card to buy some digital games but maybe next time. Oh yeah, and I pre-ordered Tekken Tag Tournament 2 at Datablitz.